Addressing the movement toward populist authoritarianism in the United States and other countries around the globe, several recent studies refer to similar movements between the two world wars and again in the 1970s. One of the most relevant cases is the demise of Germany’s Weimar Republic and the ascent of Hitler’s Third Reich. Many histories analyze this process in 1930s Germany. 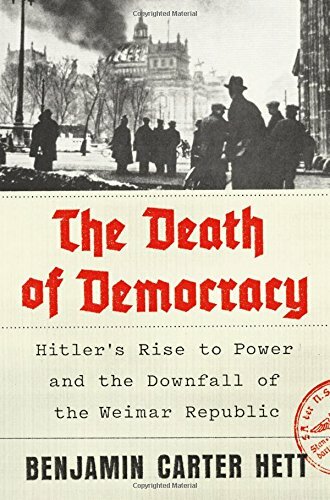 Benjamin Hett’s book builds on these studies and on his previous writings to provide an authoritative and readable analysis of the death of democracy in Germany. Deeply researched and well balanced, Hett’s book offers profound lessons for Americans and others—warnings about the political dangers they face and what real democrats should oppose. Hitler’s rise to power and his conduct as chancellor anticipated those of Donald J. Trump. Hitler lied all the time but he also stated clearly what he planned to do. Hitler espoused and utilized the “big lie,” but he called his political foes the real liars. Jews, he said, had long been masters of untruths and slander. Germans, Hitler said, were the master race. In Mein Kampf, however, he wrote that the mass of Germans are “lazy and cowardly.” He thought their “quality” inferior to the English. Another paradox: Hitler had no close friends—even his mistress Eva Braun was just another person to be used. Still, he had a remarkable intuition for the thoughts, hopes, fears, and needs of other people—both as individuals and as crowds. A consummate actor, he made a favorable impression on crowds and even on statesmen such as David Lloyd George. Hitler posed as a political genius who went his own way, not dependent on any party or backer. But he would have gone nowhere except for the circumstances after the Treaty of Versailles—a sense of humiliation and fear among many Germans. Given that Hett tells this story in a relatively short compass, he could have done more to assess the role of external forces. He does not mention how the 1922 Soviet-German Rapallo Treaty and their clandestine military collaboration brought the two pariah states together against the victors at Versailles in the 1920s. Nor does he discuss how France and Czechoslovakia torpedoed the 1931 Vienna Protocol plan for a German-Austrian customs union, a measure that could have eased economic problems in Central Europe and beyond. Hett could have done more to underline how Stalin’s directives to the German Communist Party prevented a leftist voting bloc against Hitler in 1932 elections. Too late Stalin saw his mistake. The USSR joined the League of Nations in 1934 not long after Hitler had Germany withdraw. Stalin then instructed Communists to join other leftist and moderate parties in opposing Fascism and Nazism. Neither Paris nor Moscow acted when Germany militarized the Rhineland in 1936. The broad picture was that the victors at Versailles were too harsh in the early interwar years and then too complaisant as Germany rearmed and expanded. The collapse of the Weimar Republic, Hett argues, was “the result of a large protest movement colliding with complex patterns of elite self-interest, in a culture increasingly prone to aggressive mythmaking and irrationality. . . .” “Few people in Weimar Germany could imagine the worst possibilities.” Some Germans assumed that no civilized nation could vote for Hitler. Millions expected his time in office to be short and ineffectual. Highly assimilated and patriotic, many Jews refused to leave their homeland, even as things got worse. Their innocence failed them, and they were catastrophically wrong about their future. Walter Clemens is Professor Emeritus of Political Science at Boston University. He is the author of more than 20 books, most recently North Korea and the World: Human Rights, Arms Control, and Strategies for Negotiation. His many articles on both domestic and international affairs have appeared in scholarly journals as well as The New York Times, The Washington Post, The Wall Street Journal, and other leading newspapers in various countries.